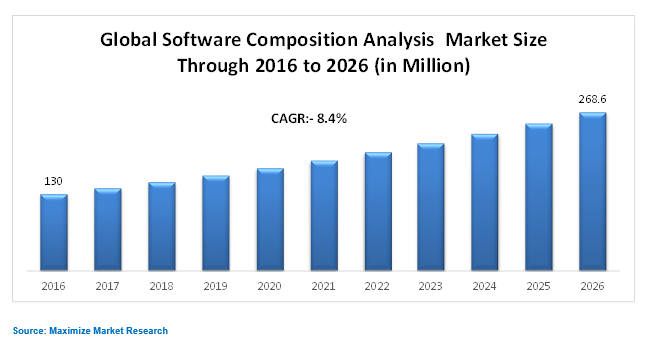 Software Composition Analysis Market is expected to reach USD 268.6 Million by 2026 from USD 130 Million in 2016 at a CAGR of 8.4%. This is a comprehensive global report focused on the current and future prospects of the Software Composition Analysis market. This report is a consolidation of primary and secondary research, which provides market size, share, dynamics, and forecast for various segments and sub-segments considering the macro and micro environmental factors. An in-depth analysis of past trends, future trends, demographics, technological advancements, and regulatory requirements for the Software Composition Analysis market has been done in order to calculate the growth rates for each segment and sub-segments. Software composition analysis is a software tool that provides data to the software developers by bifurcating the software faults for open source components. Software composition analysis vendors provide open source tools and also the functionality of outdated tools for safety assessment. The most important thing is, if user or vendor builds any software via open source components accessible in the market, the SCA tool will assists to avoid any problems from safety factors hiding in those components. Additionally, SCA tool provides advantages such as extra information assisting to identify and resolve vulnerabilities quickly, automated scanning highlights license risk exposure, flexible policy enforcement increases alignment with business requirements, and product integration supports existing development processes. The rising threats for the open source codes and the growth of IoT based software products reliability on the open source coding are the major reasons for the growth of this market in the forecast period. • Complete analysis with respect to individual growth trends is incorporated within the scope of our study. • Comprehensive analysis of factors that are instrumental in changing the market scenario, prospective opportunities, market shares, growth strategies along with identification of key companies is profiled. • Detailed quantitative analysis of the current and future trends for the forecast period has been profiled. • Software Composition Analysis Market analysis and segmentation with respect to the component, deployment mode, organization size, vertical, and geography. The research methodology used to finalize the market value and forecast the software composition analysis market has been done by capturing the data of the revenues of key vendors via secondary sources, such as press releases; annual reports; associations and consortiums, such as the Information Security Research Association (ISRA); IEEE Cyber Security Community; RSA Security; the SysAdmin, Information Systems Security Association (ISSA); Audit, Network, and Security (SANS) Institute; and SC Magazine; databases such as D&B Hoovers, company websites; Factiva, Bloomberg, BusinessWeek; and news articles. Vendor offerings were also taken into consideration in order to determine the market segmentation. The bottom-up approach was applied to estimate at the global market size of the market from the revenues of key players in the market. After the overall market size was estimated, the market was fragmented into segments and sub-segments, which were then verified through primary research by conducting extensive interviews with key people, such as Vice Presidents (VPs), directors, Chief Executive Officers (CEOs), and executives. Maximize Market Research offers customization of the report and scope of the report according to specific requirement of our clients. Global Healthcare Chatbot Market – Global Industry Analysis and Forecast (2018-2026) by Component, by Deployment model, by Application, and Region. North America Virtual Data Room Market – Industry Analysis and Forecast (2017-2026) by Component, Deployment Type, Organization Size, Vertical, and Geography.